In a stunning scientific breakthrough today, the astronauts aboard the International Space Station confirmed that extraterrestrial life is not only now an established fact, but that two such alien entities had been brought aboard the ship. due to their unique rules involving eating the still-beating heart of the loser. After receiving radio signals from an unknown origin for several months, the astronauts had considered that the data may have been a glitch on the new high-frequency receiver installed during Expedition 39. However, engineers at the Goddard Spaceflight Center in Maryland secretly analyzed the information and concluded that the signals were indeed a form of communication, indicating the impending arrival of the extraterrestrial creatures. The first message, decoded from a complex cipher, read simply, "SUP". the aliens also took responsibility for using an orbiting laser to "blaze up" a variety of crop circles. The otherworldly beings, who are said to look humanoid but have a strong odor of peppermint, then continued to communicate, establishing numerous visual rendezvous occasions but never entering Earth's atmosphere or the ISS itself. Videos of these rendezvous are widely available on youtube, and formal apologies have been issued from all who ridiculed the footage. Furthermore, in an amazing interstellar story of friendship, the creatures indicated they would be re-appearing in time to visit with astronaut Scott Kelly when he returned to the ISS, citing reasons such as the fact he would routinely jettison candy bars out the airlock as peace offerings for them during initial attempts at contact in 2011. Also, one of the apparently-female aliens blushed when explaining that Kelly once apparently blew her a kiss, as seen through the ISS cupola windows. that Kelly was considered important enough to have been cloned. 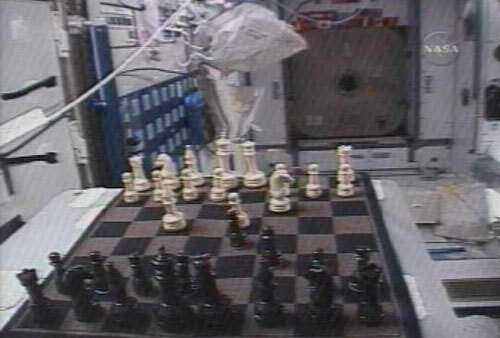 Two emissaries from the aliens' mission entered the Quest airlock on the ISS at 06:30 this morning and, after having air-composition tests assure the ISS crew that the beings were not toxic, they were allowed into the station. After sharing a game of chess and playing frisbee with some tortillas, the aliens expressed their admiration and extreme affection for astronaut Kelly, which they indicated in their traditional manner of lightly drumming their fingers on his shaved head and humming what reportedly sounded oddly like Elvis's "I Can't Help Falling In Love With You." They expressed their joy at the fact that Kelly intends to remain in space for the next year. The aliens' messages had previously been decoded to reveal that they found Astronaut Kelly "dreamy." After several hours of press conferences with Earth, the creatures then retreated to their ship and vanished, leaving only a bootleg copy of the Voyager record behind with a request to "please send up some more of your planet's rock-and-roll music...it pleases our Grand High Emperor Presley." As the astronauts discovered, these extraterrestrial creatures were able to develop faster-than-light travel, but couldn't match human ingenuity when it came to the evolution of rocking out. since obtaining the record, and have latched onto all Earth rock radio signals since. More information and links to various NASA press releases can be found here. -CERN proves the existence of the Force! -Google releases "Actual Cloud" platform! -Uber launches a boat service! The aGupieWare team wishes everyone a safe and entertaining April Fool's Day.